My paintings are succulent in color and reductive or repetitive in composition. The grid provides an underlying structure for much of my work. Silk Road is chromatically juicy and compositionally reductive. 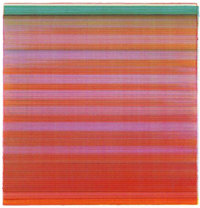 I refer to it only partly tongue in cheek as “lush minimalism.” Each painting in the ongoing series is a small color field achieved by layers of translucent wax paint applied at right angles. The series, which I began in 2005, was inspired by the shimmery quality of iridescent silk, hence the title, but quickly evolved into more expansive explorations of hue and surface. In plying a richness of paint against the austerity of a (very subtle) grid, I set in motion a small-scale dynamic in which more and less jostle for primacy. With Chromatic Geometry, I’ve skewed the conventional 90-degree structure of the grid so that it has become a field of attenuated diamonds that are integral to the visual structure of the painting. Formally I’m thinking about the division of the diamonds into greater or lesser amounts, allowing me to resolve relationships of color and shape. Each little triangular shape is a fulcrum that affects the equipoise of the field. With the horizontal division of the field into two hues, something else is taking place: an ambiguous figure-ground relationship. 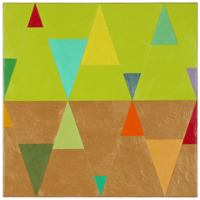 Those differently sized triangles are now visually kinetic, shifting between foreground and the deeper space suggested by that planar meeting of hues. I hadn’t intended it, but there it is, a welcome surprise in the order of things. Being accustomed to fast-drying mediums—encaustic, gouache, graphite in alcohol—I was surprised to find myself drawn to oil for this series, but the schmear of oil yields a surface like no other. And half-dry oil paint invites incursions. What I love about the medium is that as I scribed into it, the displaced paint built up in globs along the skived ridges. There is no underlying meaning here, just a love of material, color and process. In this small series of gouache-on-paper paintings I explored grid as weave, or perhaps its opposite. 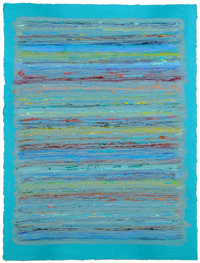 Soie is related conceptually to Silk Road, but it is as easy and light as encaustic is demanding. Gouache is velvety and flat, and it flows off the brush. (Soie is, of course, French for silk. I wanted a title to signal a connection to its related series without being too obvious.) Turning the square on its axis changed everything about the composition. The diamond asserts itself, pushing rigorously outward while remaining resolutely poised. Usually color is the focus of my work, but an achromatic palette affords me the opportunity to mine the rich tonal variation inherent in black and white. In Diamond Lattice I worked with two interacting diamonds afloat on a field of indeterminate space. 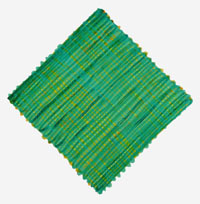 Receding and advancing, the diamonds carry out a pas de deux in each work and, I hope, a larger interaction when viewed as a group. Diamond Lattice was painted on 300-lb. Fabriano hot press, a heavy watercolor paper with a surface rich enough to absorb the density of powdered graphite. 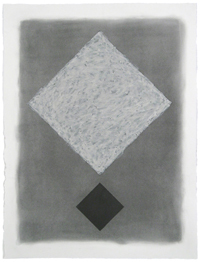 In the latter part of the series I introduced micaceous pigment to impart a shimmer that seemed right for the concept of “diamond.” Though the shimmer may not be initially apparent, it becomes visible when you view the work from an angle. Silk Trail began in 2010 when the cyan in the all-in-one color cartridge ran low as I was printing. What I’d wanted was the image of one of my Silk Road paintings. Instead, I got one with bands and striations. Bands of color signaled the last gasps of uniform color; fine striations were the machine’s vain attempt at producing the color field. The composition was minimal but the color was rich, an accident I could work with since that’s what my paintings are all about, too. I overprinted that first print with a different image. Then I sent the sheet back through the printer, but from the bottom rather that the top. Pleased with what I saw happening, I printed many pages multiple times. The results were glorious: overlays of slightly out-of-register color with a gouache-like richness or a watercolor-like veil. Quite literally out of the blue I stumbled upon a new way to explore color that is very much in keeping with the way I paint: layer on layer, relying on the interaction of hues to produce richness and depth. Production of the prints is sporadic. I get to make about 20 at the end of the life cycle of each color cartridge. I work primarily with an HP office printer on Epson archival print paper. Each print is unique and sufficiently archival to last a lifetime.